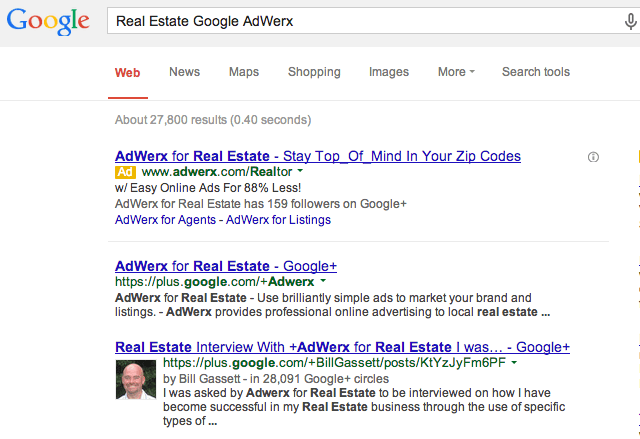 You can see in the search terms that we wanted to find information about Google, real estate and AdWerx. One of the first results includes an article by Bill Gassett from a post he authored for our blog. Because Bill has Google+ Authorship set up, his article includes his photo and information right in the search results. Why do you need this for your real estate business? If you’re actively blogging on your website, including your photo and byline is especially helpful for your branding. Studies have shown that use of Authorship increased clicks to links, as they take up more space on the search results page. Indeed, experts such as Bill Walls agree that it leads to increases in click-through rate of 30-150%. However, others claim that due to changes in the system and the algorithm, Authorship has become less prominent in results. This doesn’t mean that it’s not important, or that you shouldn’t have it. In fact, Google Plus expert Mark Traphagen says he is confident that “this Authorship update is not static.” So while Google continues to work out the kinks, it’s important that you set up your Authorship, publish on high-quality trusted sites, and work on creating valuable content (tips Traphagen recommends on stonetemple.com). Now that you know what Google Authorship is, here’s how you set it up! The good news is, it only takes about 15 minutes! If you need more detailed instructions with some visual help, check out Katrina Benton‘s article on ActiveRain. 2. Add your real estate website or blog url to the contributor section. Make sure “Current Contributor” is selected. 3. 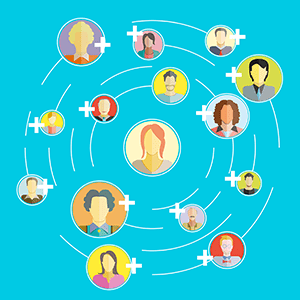 Add a link to your Google+ profile on your website or blog. 4. Visit https://plus.google.com/authorship to verify your email address. 5. Double check to make sure all systems are a go. Also be sure that if you are not happy with your photo or byline, you edit them within your Google+ profile. Did you get it set up? Let us know how it went in the comments below and share links to your Google+ pages so we can add you to our Adwerx circles.